It’s the start of a new month! I don’t know about you, but for me that means one very special thing – I get to erase the whiteboard calendar and start anew! Ahh nothing beats the aroma of a dry erase marker on a rainy spring morning. By the 29th or 30th of every month, I am breathless in anticipation of my wipe off / write on ritual. If you do not have a whiteboard calendaring system, I suggest you get yourself to Storables STAT. Don’t be distracted by the pretentious food storage systems. Keep walking past those overpriced closet organizers. Focus, people, FOCUS. The most worthwhile investment is a stylish yet affordable whiteboard calendar. Does it need to be the 2014 model? No, you silly fool! With a whiteboard, you can change the date – including the year! It never expires!! The revolutionary ability to quickly wipe away mistakes or cancellations on a whiteboard allows you to change your entire schedule in just seconds. The only thing that would be easier is if some sort of machine or technological advancement made it possible to create and modify a calendar with the push of a button on a handheld device. But if you think that kind of futuristic robot exists, then I’ve got some land in Florida to sell you! ‘Disnieland’ on the 1st, a ‘fashin show’ on the 15th, fly back on the 31st. So precious! Now erase that hopeful garbage and fill that whiteboard to the brim with PTA meetings, swim lessons, doctor’s appointments, birthday parties, snack duties, field trips… Get after it and make it a good one! Happy April! This entry was posted in Uncategorized by BananaWheels. Bookmark the permalink. Thanks, that is a nice way to forget your shortfalls. I think we should keep a white board when we are working towards something so that we can wipe out the failures and just focus on moving ahead. Holy cow! 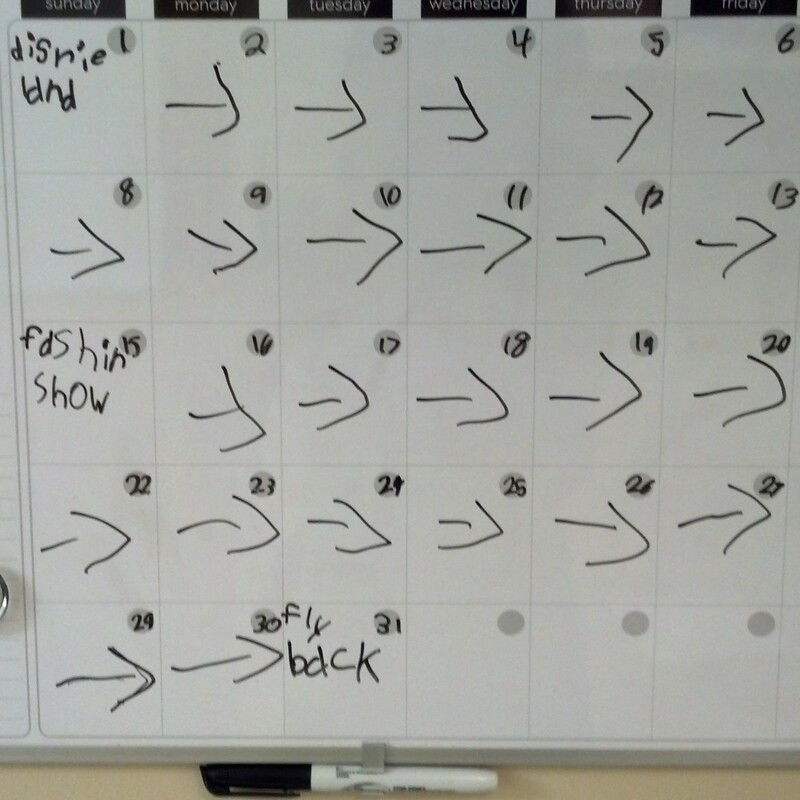 I need to send you the picture of my dry erase calendar. It hasn’t been changed in literally six years. There are appts written down to go to My OB with Luke and that breast feeding class I never went to. I can’t change it now because it’s like a snapshot of our life then. I thought we could be friends, but this may be a deal breaker. It will now be my life mission to get my hands on your calendar and update it.